The Forum of Private Business becomes '40 years in business’ in September 2017 and in that time we have been supporting our members and constantly re-investing our profits into improving the products and services that we can offer as a national UK business membership organisation. By becoming a member of the Forum you will join a business organisation that is helping to provide business owner’s support, advice and protection to face all different types of business challenges. Since the Forum was established in 1977 business landscapes have changed dramatically but whatever the business challenge we are here to help 24/7. To mark the milestone of '40 years in business' we have added to our collection of Forum guides. 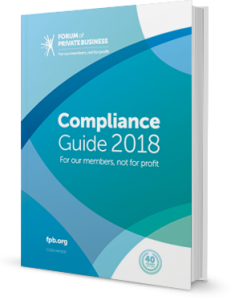 The Compliance Guide is now the Forums newest guide and also becomes inclusive with the Forum Membership and Forum Start-Up membership. The guide has been researched and has been put together with the help of our legal partners and ACRA - The Association of Company Registration Agents. We believe the guide to be very comprehensive and a jargon-free easy read. We have referenced areas for further reading/research along with an introduction to where you may need to be to be compliant with your business. The Forum believes it is vital to have the right support, advice and protection in place and that means to be more than just the average one size fits all businesses advice that is currently available. Most business owners find that after a few months of trading, they come up again things they didn’t know and need help to overcome them, but where do they go? We want your business to be successful and profitable and will give you and your business the best chance of succeeding.